Alaska, a snowboarding destination so talked about but so seldom traveled to by the resort populous. The giant coastal mountains of Alaska are a far off land that are filled with dangers. I’ll be the first to say that it’s easy to let natural road blocks stop a trip from becoming more than coffee shop chatter. I have causally talked about going to ride AK many times but only in a joking manner. Dreaming about big mountain AK riding became a daring possibility this spring, after a crummy snow season left me wanting more. 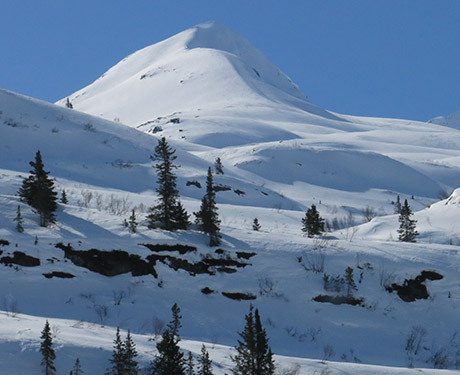 A week long sled trip to BC in mid-March fell through due to weather. After that trip was canceled, Reid found motivation to fill a void in the season. Jacob Levine started egging Reid on about going big for cheap. The two boys had a crazy idea, one that they firmly planted in my head and it quickly grew. Before I could put the breaks on, a trip had formed. Renting an RV in Anchorage and touring the nearby Turnagain Pass was booked, locked-in, on the calendar. Plane tickets were cheaper than expected, RV rentals offered an affordable and attractive getaway. The travel time seemed reasonable—all pieces of the puzzle pointed to yes. The trip was locked in for the last week in April, to hit Turnagin Pass. Adventures constantly veer in surprising directions. These little curves can’t be viewed as hurdles. They are better to be excepted as valuable parts of the experience. With less than two weeks before departure, Mikey Allen joined the crew after loosing his job. He took advantage of an unfortunate loss in style. Our crew was stronger with the addition of a fourth man, allowing us to upgrade the RV size and receive unlimited milage. The weather in Turnagain was our next turn signal. The winter weather in Alaska had been almost as dismal as in the Northwest. Our easy drive to Turnagin Pass turned into a steeper adventure, taking us to higher ground on Thompson Pass, a 6 hour drive around the Chugach mountains. 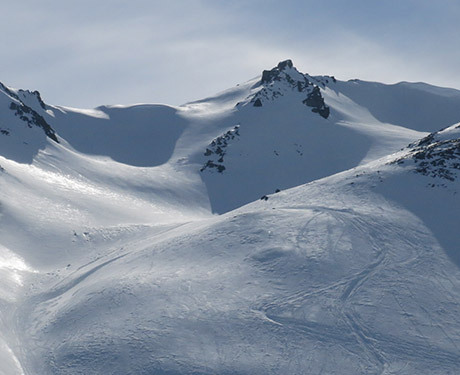 Thompson Pass is a major destination for backcountry snowboarders, said to be the birthplace of heli-skiing. Using Mikey’s valuable experience in the area and Reid’s freshly printed topo maps to guide our ascents, Thompson Pass became the mission and our home for six nights. We gathered information while parked in the dirty road-side lots of Thompson Pass. Other skiers, borders and snowmobilers from all over the world had staked claim at every turn-out. RVs, tents, yurts, heli-lodges, and enclosed sled trailers are scattered throughout the Pass parking areas. Refreshing stories from other weathered campers, dropping work to make an annual trip to the Pass were shared over cheap beers. We instantly felt the community and lawlessness of this grand valley. Our weather window was as good as we could ask for with this being most of our first time riding Alaska. Soft snow was trapped up high above the road. We toured on splitboards under clear skies and warm weather for 2 hours each morning. 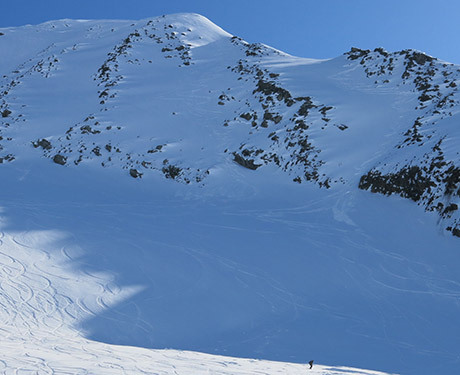 3000–5000 feet of vert was climbed each day to reach the left over powder from a recent 1 foot refresh. 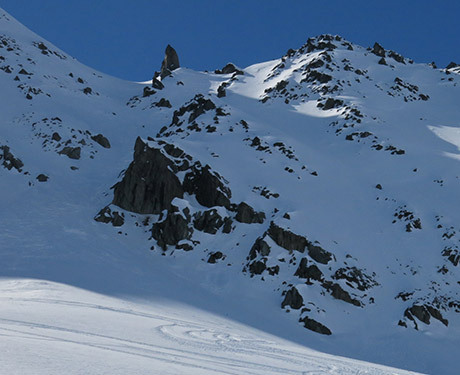 The old snow made the avalanche conditions very stable allowing steep terrain to be safely ridden. The conditions downside for this trip was that only steep, north facing aspects were good to ride. Snowboard terrain stretches in every direction in the Pass, however, we were on a search for very specific lines that would hold soft snow after days of warmer weather. Our runs down to the valley floor at the end of each day were often not as glorious as we hoped for having walked to our lines. I will go as far as calling it “survival boarding” down the bottom 1/3 of the run, on days the sun didn’t break the low elevation ice crust. Big days of touring and hiking up scary ridge lines created for huge appetites. Multiple trips to Valdez were made to restock our supplies. On the hill, Jakob and I were the least comfortable with the steep pitches of Thompson pass. By day 5 of riding, we were feeling stronger and able to put ourselves more safely at risk. An ice axe soon became my friend on this trip. Crampons were never needed but touring ski crampons are highly recommended. I felt challenged and scared much of the time I was in the higher elevations of Alaska. It’s a long ways down if you slip and there is only your teammates to help rescue you. This challenge was exactly what I was looking for. My riding ability softens with each season of riding Meadows. Trips to Alaska are certainly a cure for anyone lacking a challenge at their home mountain. Mikey lead the charge with his big mountain experience and motivation to ride steep terrain. Reid followed closely with strong backcountry knowledge, while Jakob and I trailed just behind. Well, maybe I was a little further back but always stoked to be pushed by the team. 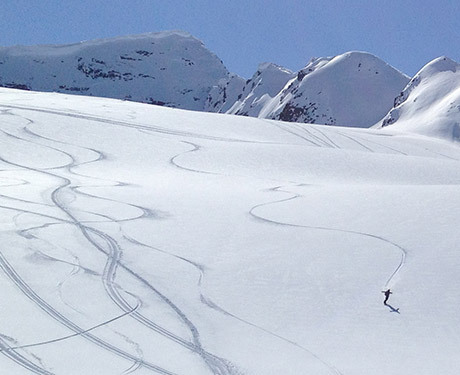 It’s a group effort to achieve turns by touring in Alaska. Five day of touring on Thompson pass. Seven nights in a 31ft RV, packed with four dudes and their thousands of dollars in smelly snowboard touring gear. This can work and does work. There is a lot of money, time, travel and energy put into a snowboard trip to Alaska. The rewards however are on a similar scale to the mountains, much bigger than meets the eye. I will speak for all of us when I say that Alaska is now on our maps and will be ridden again. Thank you Reid and Jacob for the strong push to make this happen. Thank you Mikey for the great iPhone photography, which half this post is based upon. After achieving Alaskan turns for less than half the price expected, I now know that cost is not the make or break factor for Ak snowboarding. Our trip hinged more on one’s ability in riding, willingness to hike all day and acceptance with being shut down but mother nature. Day 1: Berlin Wall laps from day 1 and 2. Right chute day 1. Day 2: Berlin Wall, one chute left, bowl warm-up lap added. Day 3: RFS north face and ridge line runs. Day 4: Odyssey bowls and center face laps. Day 5: Python, pre-summit chutes.